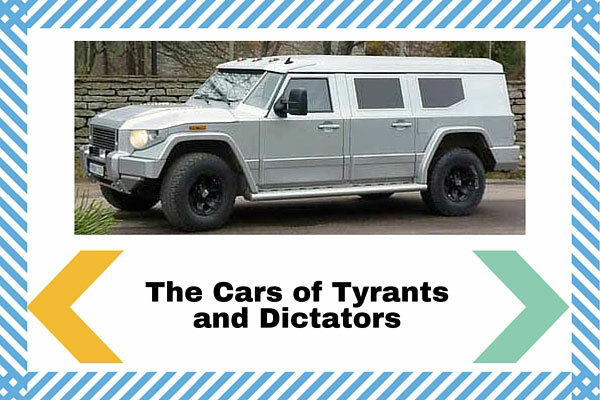 Curious about what kind of rides the tyrants and dictators of the world have? It seems that their hunger for power is just as similar as their taste for horsepower. They all seem to love one brand: Mercedes-Benz. I was watching a documentary about North Korea and it was interesting to see that their former leader and founder Kim Il Sung, father of the present leader Kim Jong Il, had his Mercedes-Benz 500 SEL displayed in the place where he was buried. This was actually what gave me the idea to write this article. So much for equality and communism: this car, at that time it was purchased was a luxury none of Kim Il Sung’s people could have. And it is not just for North Korea, communist leaders seem to have a thing for Mercedes-Benz. Other communist leaders who love Mercedes-Benz include Fidel Castro (Cuba), Pol Pot (Cambodia), Leonid Brezhnev (Soviet Union), and many others. Even non-communist dictators like Ferdinand Marcos of the Philippines owned multiple luxury models of Mercedes-Benz. I guess there is really something in this brand that really attracts powerful people. It is even rumored that Saddam Hussein’s Mercedes-Benz had flamethrowers in it. Moreover, not just evil dictators have it; even the Pope’s infamous bulletproof “Popemobile” is a Mercedes-Benz. So what’s really the deal here? Is there some sort of conspiracy regarding Mercedes-Benz‘s seemingly unethical clientèle? Well, this is why there is a certain pride to owning a Mercedes-Benz. If you’ve always dreamed of ruling the world or you want to feel like you are a powerful dictator then Mercedes-Benz is the car for you.